A fire broke out at a gas station in Turkey's southern Antalya province after a lightning strike, reports said Saturday. 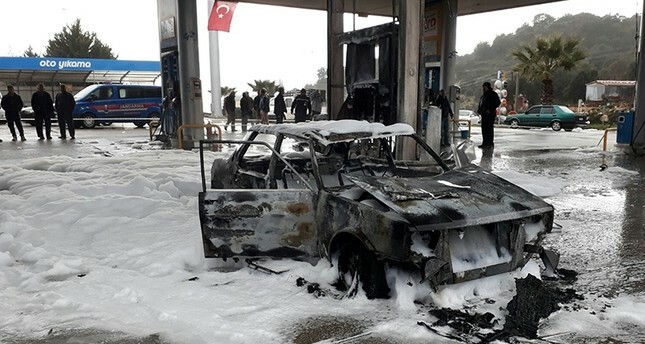 The incident took place in Kaş district after lightning hit a pump at a gas station and a vehicle caught fire as it was fueling up. Three people inside the vehicle were immediately rescued with the help of gas station workers, Ihlas News Agency reported. Firefighters also arrived at the scene and extinguished the fire. No injuries or deaths have been reported, but the lightning caused serious material damage to the gas station and destroyed the vehicle. Located on southern Turkey's Mediterranean coast, Antalya is a popular resort town visited by millions of tourists.